On Saturday, October 20, 2018, the Wisconsin Aviation Hall of Fame (WAHF) held its 33rd Annual Induction Ceremony in Oshkosh, Wisconsin. Approximately 250 individuals filled the Founder’s Wing of the AirVenture Museum to witness the induction presentations and celebrate scholarship recipients. The four inductees were Joshua Sanford, Janis Sierra, Donald Winkler, and Jerome LeBerron. The three scholarship recipients were Emily Bennett at Southern Illinois University Carbondale, Aaron Wahlgren at Gateway Technical College, and Isaac Lee at Fox Valley Technical College. Maureen Sanford accepted the plaque on behalf of the Sanford family. She greeting the crowd and named family members in attendance, “What a great evening. My name is Maureen and I’m here tonight with my family, my brother Bill Sanford, his wife Linda, their son Joshua, his wife Mandy, and their sons Braydon and Braxton, my daughter Heather Bruin, and my cousins Bill Kirkwood, Lawrence Kirkwood, Kent Kirkwood, Harold Kirkwood, and their families. 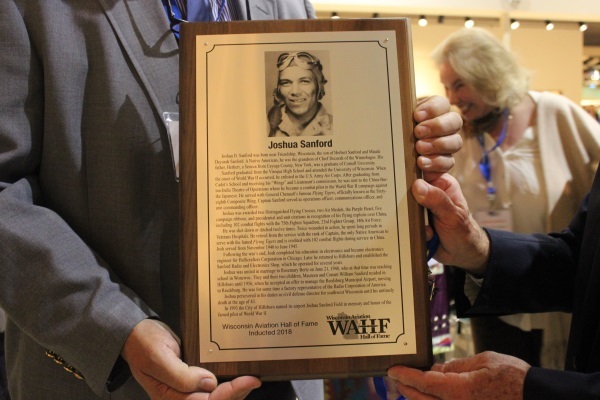 We’d like to take this time to thank you for inducting our father, Joshua Decorah Sanford into the Aviation Hall of Fame. “We’d like to share with you the story of our father, grandfather, and uncle. The story of a man, an aviator from our beloved state of Wisconsin, who ultimately gave his life for his country. He died at a very young age when we were very young. Throughout my life, I often wished I’d known this man better, but I was inspired forever by his deeds, his lessons, and his words. “He did not learn the language of English until the age of 7. Yet, without prejudices, he considered himself an American. He taught us tolerance, moreover respect for diverse religions, cultures, peoples, languages, everything on this planet. I have to admit that he spun tales of all those differences he experienced during his life and especially during his war travels. My insatiable wanderlust was born from these.